Yesterday, friend of the blog and commenter Ryan played at the Town and Country Club in St. Paul. I asked him to snap a photo of downtown Minneapolis when he was on No. 9 (that’s the hole that runs along Marshall Ave.). It looks like the photo was shot from the right side of the fairway. You can see the driving range in the foreground and small piece of the clubhouse. I think it is a cool view. I don’t exactly why, but I like holes with skyline views. Maybe it’s because I grew up in a town of less than 20,000 that probably doesn’t have a building taller than about five stories. I don’t know. All I know is that I think it is cool when you can see a skyline in the distance. There are obvious examples of this in the Twin Cities: You can see the Minneapolis skyline very clearly from spots at Minikahda, from the par 5 that runs along Hwy. 280 at Midland Hills, from several spots at Theodore Wirth and Golden Valley and the hole above. But there are also some less obvious ones. 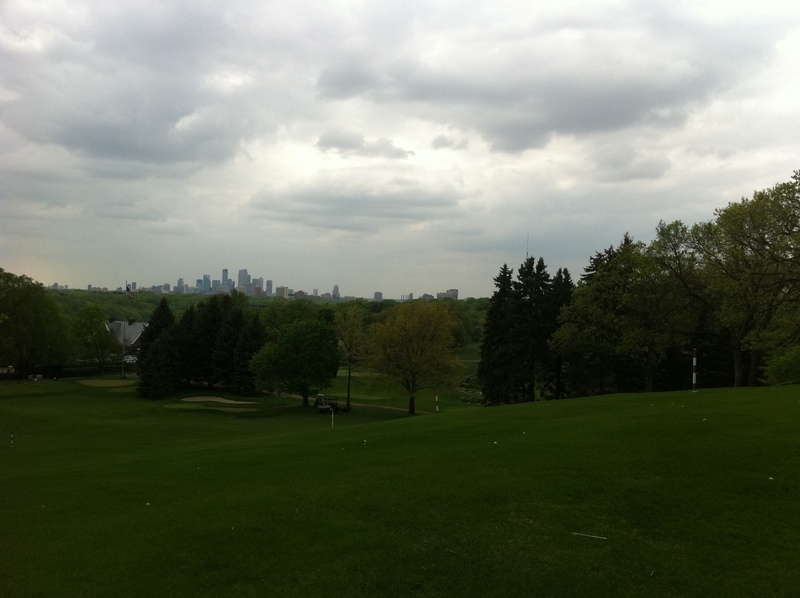 You can actually see the top of the Minneapolis skyline from (I think) the 18th tee at The Wilds, a course that is 25 miles away. You can do the same from the 14th tee at Hillcrest Golf Club in St. Paul and the second green at Somerset in Mendota Heights. Both of those courses have to be at least 15 miles away. Any other good ones out there, whether in MSP or elsewhere? So happy golfing this weekend friends. And to my golfing friends in Minneapolis, let’s hope the rain stays away a little. Harborside in Chicago and Granite Links in Quincy, MA (Boston) to name a couple. If I remember correctly the first tee on Judge at Capitol Hill has some good views of the Montgomery smallish skyline. I think when I hit it there at about 7:45 in the morning, I was more concerned about where in the world I was going to hit the ball. Not a lot of room there. The benefit of Chicago’s very tall skyline and general lack of elevation is that on a clear day you can see the skyline from 15-20 miles away. Thanks to a couple high tees you can see the skyline very well from The Glen Club. T&C was my “home” for seven seasons. I love the place and it will always a little more special to me than anywhere else. That view is really something. I remember the first time I saw it, wow, very impressive. Funny thing is I don’t that I have my own photo of this shot. The buildings always look much farther in photos than when you are standing there. In person it looks like you are right on top of them. Nice post Jeff.